This article intends to provide detailed, step-by-step instructions that’ll help you understand, how to set up ELEX EasyPost Shipping Method Plugin for WooCommerce. Refer the product page to know more about other various features of the plugin. EasyPost is a flexible API that enables you to access shipping rates from multiple shipping carriers like USPS, FedEx, UPS, DHL, Amazon Services, Australia Post, Canada Post and so on (see the complete list here). Our ELEX EasyPost Shipping Method Plugin for WooCommerce provides easy, seamless integration of WooCommerce with EasyPost services. You can access real-time rates from shipping carriers like USPS, FedEx, and UPS. In addition to accessing real-time shipping rates, the plugin also provides shipping label generation, box packing, and shipment tracking facilities. How to generate EasyPost shipping labels in bulk? How to auto-generate and email EasyPost shipping labels? How to print EasyPost return labels? Real-time shipping rates: Based on the shipping destination address, product weights, and dimensions, the plugin fetches real-time rates from selected shipping carriers(USPS, FedEx, and UPS). 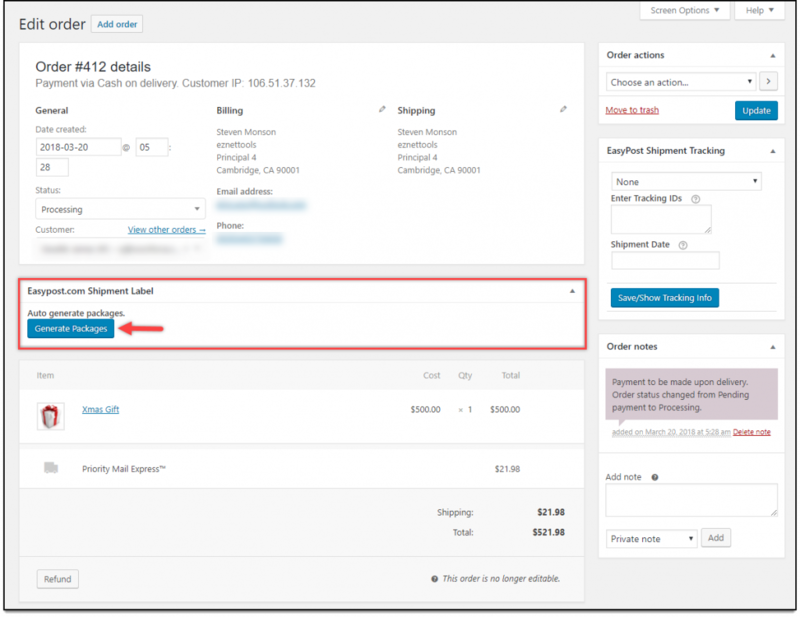 Printing shipping label: You can print shipping labels from order pages in the back-end of your WooCommerce store. The store admin can also update the shipping service while printing the label in the back-end. USPS Flat Rate Boxes: Flat Rate Boxes are basically boxes with flat postage rates. These boxes are ideal for any package size. Read more about USPS flat rate boxes here. Box Packing: The plugin provides two packing methods. 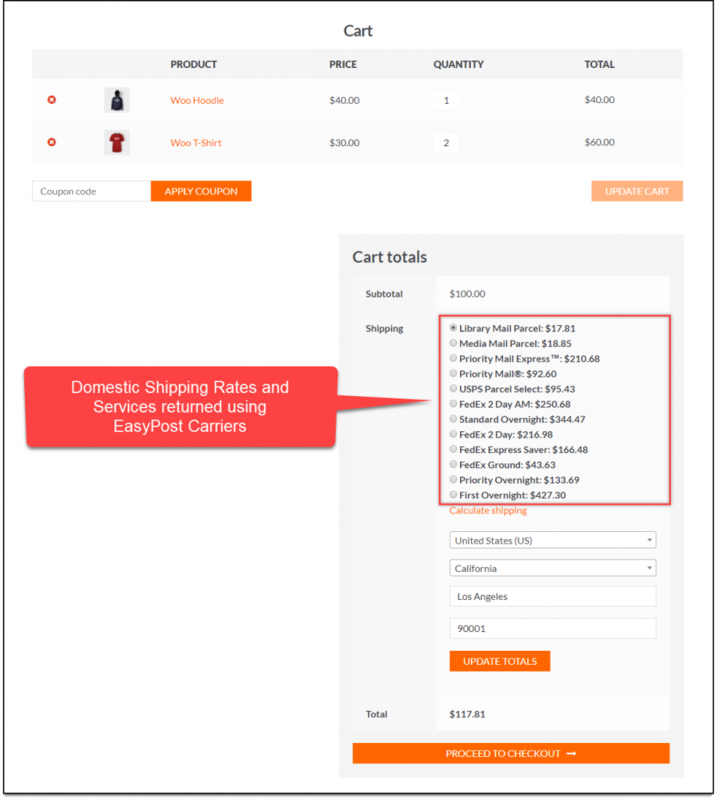 These methods will also affect the shipping rates displayed on your cart/checkout page. 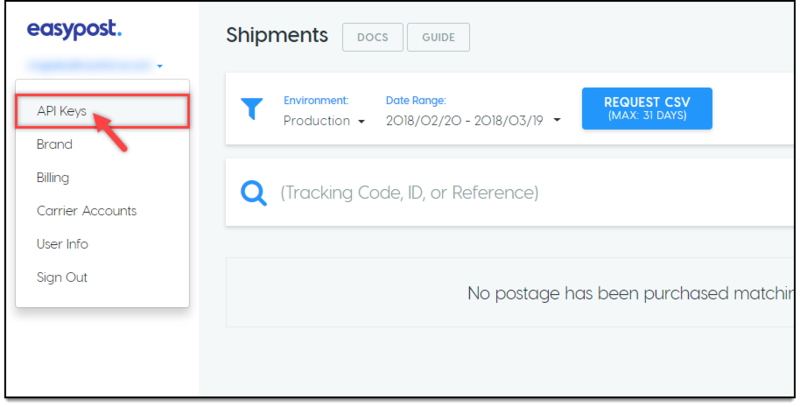 Shipment tracking: The tracking number returned from selected shipping carriers while generating the label will be added to order notes and sent as part of the order completion email. All these features (and many more!) are bundled into one solution to serve your WooCommerce-EasyPost shipping integration needs for your online store. 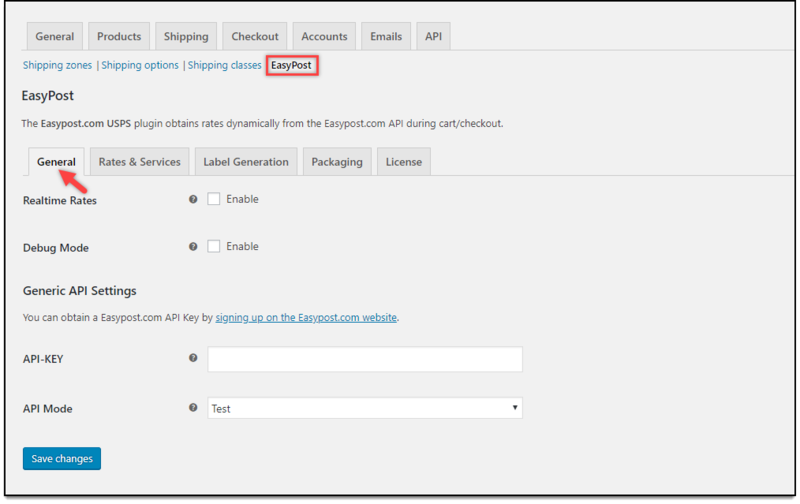 Dashboard > Plugins > Installed Plugins > ELEX Easypost Shipping Plugin for WooCommerce > Settings. Now that we know what the plugin has to offer, and have installed the same, let’s get down to configure the plugin. Real-time Rates: Tick this checkbox to enable real-time rates. Debug Mode: If you are not getting proper rates (lesser or higher than expected), not getting all the available shipping options, or not getting any rates at all, then you can tick this Debug mode checkbox to find the error(s). You can also see the warning(s) by our WooCommerce EasyPost plugin. API-KEY: For accessing Easypost.com APIs, you need to register with EasyPost. After successful registration, you’ll receive test key and live key. Enter the receive API key in this field. How to register for Easypost.com? 2. Enter all the required details in the given registration form and signup. 3. Once you have signed up, go to Account > API Keys, as shown in the screenshot below. 4. Copy relevant API keys(Production or Test), and paste it in the API-Key text-field of our EasyPost plugin. A sample screenshot of the credentials is as shown below. API Mode: You can enable TEST mode to try out your plugin settings(for checking real-time rates, label printing or so on), and switch to LIVE mode for accepting real order transactions. This section contains settings that will determine the services that will be made available to the customers in your WooCommerce store. The settings are as shown below. Method Title: Allows you to set a custom title for EasyPost shipping method. This title will be visible on cart and checkout page under Shipping options. Method Available to: This field allows you to select countries, for which you want to offer EasyPost shipping method. All Countries: Choose this option if you want to offer EasyPost shipping method to all over the world. This option is selected, by default. Specific Countries: Provides option to select desired countries. The EasyPost shipping method will be available only in selected countries. Zip Code: Enter the zip code of the sender. This zip code will be used for calculating shipping rates. Sender Country: Select the desired sender country. Flat Rate Boxes: Allows you to select USPS Flat rate boxes. Flat rates are hardcoded in our WooCommerce EasyPost plugin. There are no USPS API calls made to get Flat rates. Read more about USPS Flat Rate Boxes and Pricing here. Flat Rate Fee: Enter Flat Rate Fee which is the additional charge on flat shipping rate. If you enter a negative amount value, then that entered amount gets subtracted from flat shipping rate. This amount is per-box excluding tax. Leave this field blank to disable Flat Rate Fee. Fallback: If Easypost fails to return any shipping rates, the fallback rate will be offered for shipping so that users can Checkout. Leave blank to disable it. Rates Type: Select Residential or Commercial rates to offer for the customers. The residential rates are usually higher than the commercial rates. EasyPost Carrier(s): Select the desired carrier(s) for shipping. 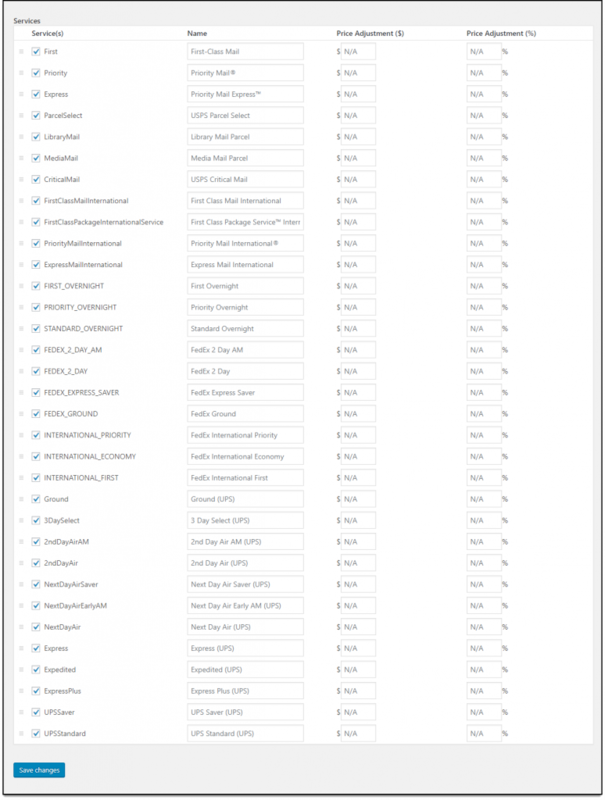 The plugin supports popular shipping carriers like USPS(default), FedEx, and UPS. You can select one or more shipping carriers based on your requirement. You can select services as per your requirement. Non-selected services are not shown to the customer even if they are available services from respective shipping carrier. The first column lists all the services from the selected shipping carriers. You can tick the checkbox of desired service(s) that you wish to offer to your customers. The second column allows you to set a custom name for the services. The third and fourth column allows you to set price adjustments(positive or negative), in terms of amount value or percentage value. For example, consider shipping cost of First-Class Mail returned by USPS is $5. Total cost displayed for First-Class Mail is $10 ($5+$5). Save your settings once they are configured. Print Label Type: With this field, you can select the desired file format for printing the shipping labels. PNG: This option prints the label in Portable Network Graphics (PNG) which is a raster graphics file format that supports lossless data compression, and is widely used in the world wide web. PDF: This option prints the label in Portable Document Format, which is used to present document in an independent manner regardless of application, software, hardware, and operating systems. Insurance: The insurance charges are accounted in your EasyPost account, but while requesting for Rates and services the API does not return the insurance charges with the shipping cost. Remember, EasyPost charges 1% of the value, with $1 minimum amount. All claims all handled by EasyPost itself. 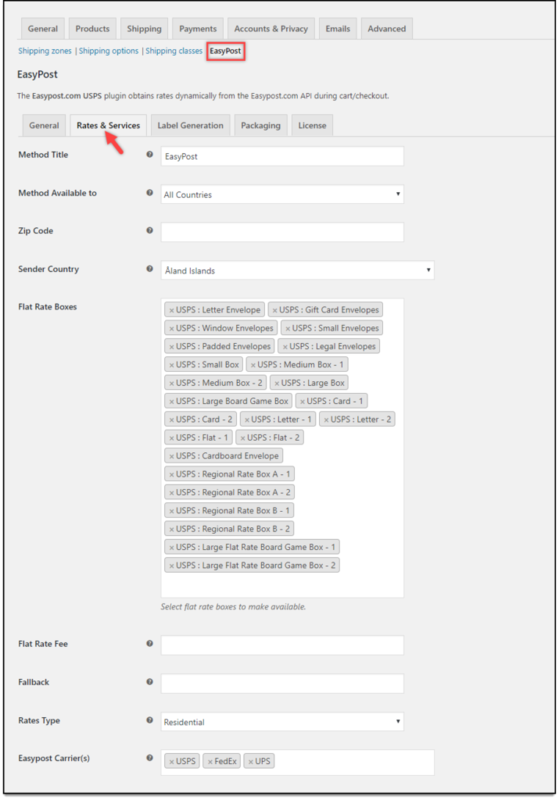 Once this option is enabled, the insurance option will be available under the label generation section in WooCommerce order page. By default, the insurance option is disabled. If customers want the shipment to be insured, they need to enable the insurance option while checkout process. Customer Choice: When selected, a checkbox will be available on the checkout page where the customers can choose to apply insurance for their package. Mandatory: As the name suggests, applies insurance for all shipments. Customers will not get any checkbox or information that the products are ensured. No Insurance: The shipments will not be ensured. Estimated Delivery Date: Shows an estimated date on which the package will be delivered to the given shipping address. Once enabled, the cart and checkout pages will display the estimated days it will take to deliver the packages as per the API’s returned data. Choose the default domestic and international service for bulk generation of domestic and international shipment label respectively. This label generation is processed in WooCommerce Orders page. If there are no shipping services defined for an order, the default services defined in these settings will be taken into consideration. Sender Details: Enter the sender name, company name, address, email address and contact number. Customs Description: Enter product description for international shipping. This description will be helpful for customs purposes. Return Address: Tick this checkbox if you want to enter a separate address for return shipment. If this checkbox is unchecked, the origin address will be taken as the return address. Once checked, enter details like name, company name, address, phone number, and email address. The packaging settings are as shown below. Pack Items Individually: In this option, each item in the cart is packed separately. Total shipping cost is calculated by adding the shipping cost for each item. This option is selected by default. Pack into boxes with weight and dimensions: If packing items individually does not suit your business, then you can define custom box sizes under Box Dimensions section. All the cart items are packed into custom boxes defined in Box Dimensions settings. The best fit box is automatically chosen from the defined boxes. This is the recommended option. You can read through setting up box dimensions to understand box packing in detail. Pack items based on weight: Enter maximum weight limit for packages. In this option, the weight of all the cart item is summed up and items are packed with maximum weight limit in the box(es) and passed to API to get rates. Additionally, you can choose to pack heavier items, lighter items first, or pack purely divided by weight. Lastly, click on the Save Changes button. Let us now move to our WooCommerce cart page to see the applied changes. The following screenshot shows Domestics rates and services returned by EasyPost shipping carriers. 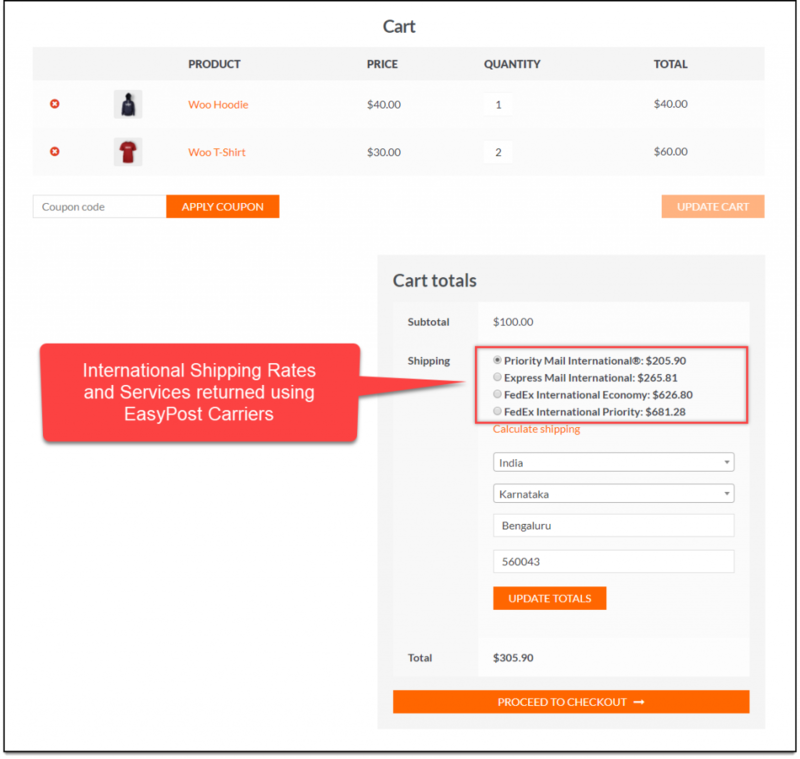 The International rates and services returned by EasyPost shipping carriers will be displayed as shown in the screenshot below. 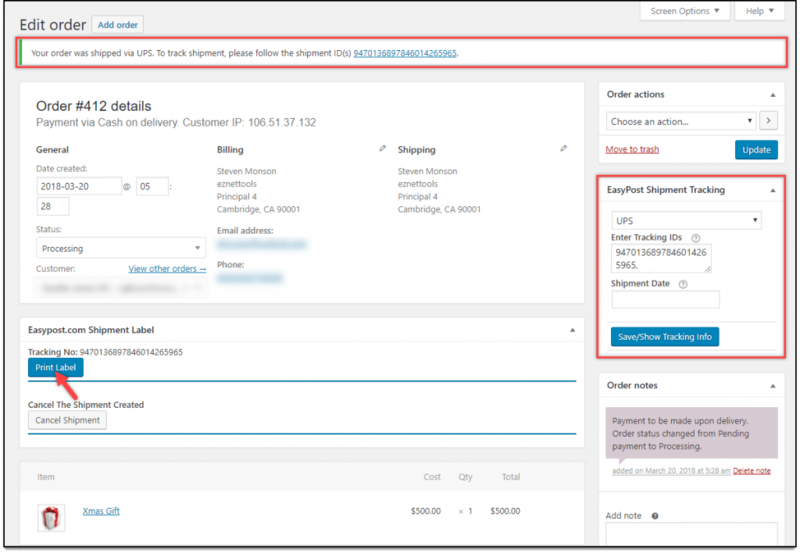 Once your customers place an order, move to your WooCommerce admin order page to generate shipping labels. Following screenshot shows a sample order page. Click on Generate Packages button. Further settings appear where you can update the previously selected service. Click Create Shipment Label to proceed. A sample screenshot is given below. Once the label is generated, you receive the shipment tracking ID as well. Next, click on the Print Label button to print the shipping label. You can notice the EasyPost Shipment Tracking metabox on the right. You can use the given tracking ID to track the shipments. Following is a screenshot of a sample Domestic Label. Documents for International shipments consist of the International shipping label, Customs declaration, and Dispatch note. 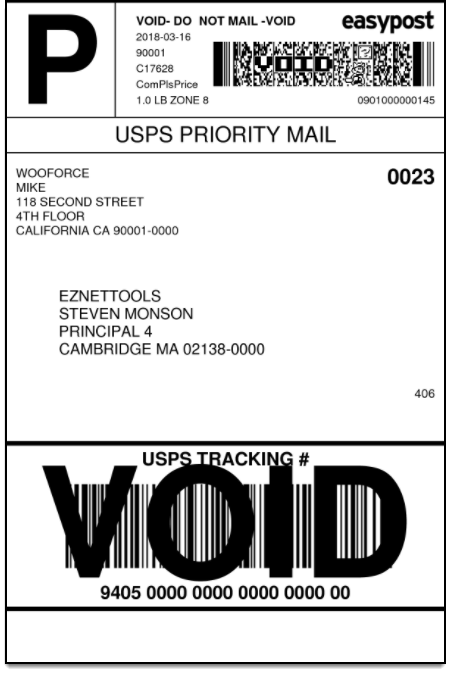 Below screenshot shows a sample International shipping label. 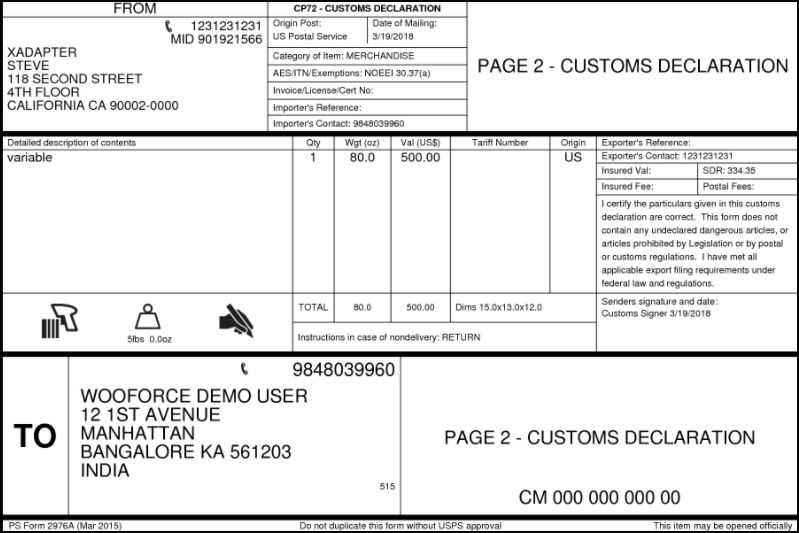 A sample Customs Declaration for international shipments is as shown in below screenshot. 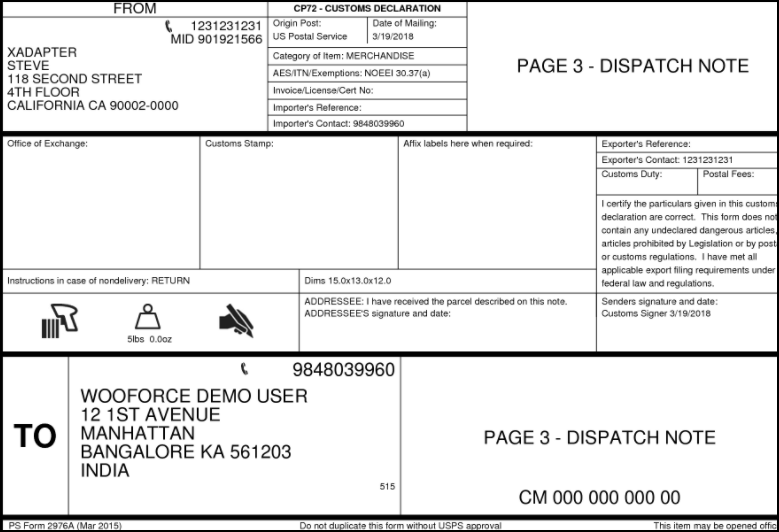 A sample Dispatch Note is as shown in the screenshot below. To generate FedEx, UPS, and USPS shipping labels in bulk, you would need our ELEX WooCommerce EasyPost Bulk Label Printing Add-On. Once you have purchased this add-on, you can read how to bulk print FedEx, UPS, and USPS shipping labels using EasyPost to set up the add-on. To generate automatically generate and also email EasyPost shipping labels, you would need our ELEX EasyPost Auto-Generate & Email Labels Add-On. Once you have purchased this add-on, you can read how to auto-generate and email EasyPost shipping labels to set up the add-on. 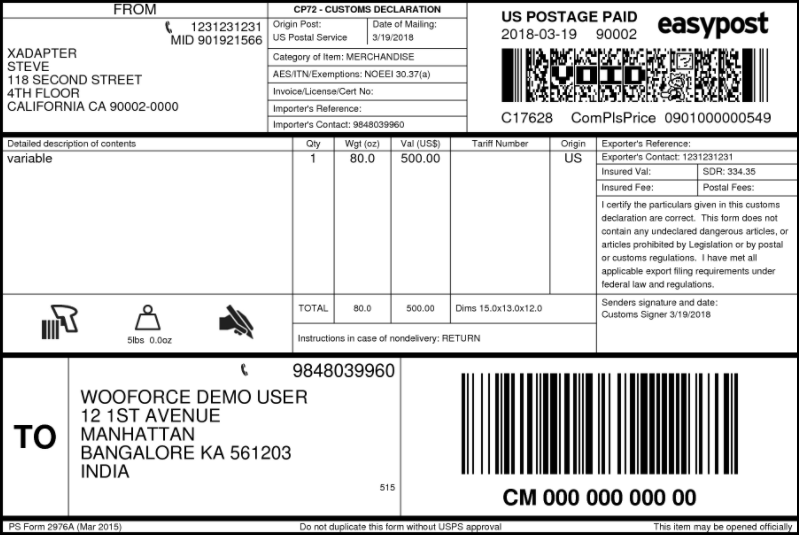 To print FedEx, UPS, and USPS return labels for EasyPost, you need our ELEX WooCommerce EasyPost Return Label Add-On. After you have bought the add-on, read how to print EasyPost return labels to set up the add-on. To explore more details about the plugin, go check out ELEX EasyPost Shipping Method Plugin for WooCommerce.